Those customary parting words still ring in the ears of thousands of Mexican immigrants who made their way to Southeastern Pennsylvania in the last decade. From 2002 to 2008, local filmmaker Laurence Salzmann made repeated trips to Puebla state in southern Mexico, the rural birthplace of many of them, seeking to understand what drew them to el Norte. The result is Echele Ganas — A Life Left Behind, an unblinking look at Mexico’s faded farmland and the relentlessness of immigrant ambition. 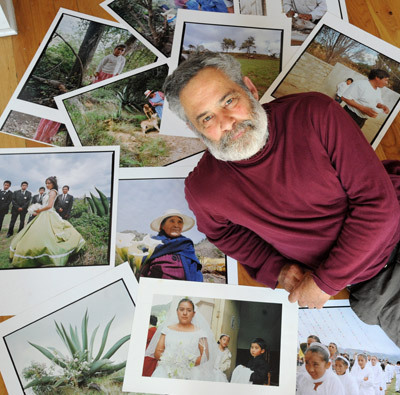 His video and photographic projects are centerpieces of De Pueblo a Pueblo, a citywide celebration of Mexican culture that begins Friday and runs to June 10. Salzmann’s work, a catalyst for the festival, tracks the lives of Alberto, Ramon, Adan, and Hernan, laborers he met in 2003 and employed to build his West Philadelphia photo studio. He chronicles their coming to the United States, and its impact on their families still in Puebla. The Mexican populations of Philadelphia, Bucks, Chester, Delaware, and Montgomery Counties more than doubled between 2000 and 2010, from 22,690 to 57,523. In Montgomery County, where the growth was largest and spurred by affordable housing in such places as Norristown, it soared 300 percent, to 13,386. At the same time, Mexicans often keep a low profile because many are illegal immigrants. They are, said Salzmann, the busboys, gardeners, and laborers glimpsed at work, often with their heads down. Organizers of De Pueblo a Pueblo, which means “From Town to Town,” hope its lineup of more than 40 films, folkloric dances, craft workshops, traditional feasts, and discussions about immigration will put a face on the people in the shadows, highlight their contributions to regional revitalization, and build relationships between them and the wider community. The daylong San Mateo Carnavalero, an annual parade of revelers in extravagant costumes, culminating in a dance party in a park at Fourth Street and Washington Avenue, anchors the festival’s first Sunday next week. The mostly free events are subsidized by the organizations presenting them. Venues include the University of Pennsylvania’s International House, Fleisher Art Memorial, and Drexel University. Organizers know their efforts won’t end the policy debates over the nation’s estimated 11 million illegal immigrants of all nationalities, how to secure U.S. borders, educate immigrant children, or protect American jobs for American workers. They hope, however, that by showcasing Mexican culture, they can play a role in dispelling contempt. Along with Salzmann and Garza, principal organizers include Ellen Owens, executive director of the mosaic madhouse on South Street called Philadelphia’s Magic Gardens, and Dalia O’Gorman, executive director of Casa Monarca, a South Philadelphia nonprofit that showcases Mexican culture and arts. Owing to the Magic Gardens’ location relatively near the heart of the Mexican community on Ninth Street below Washington, it is De Pueblo a Pueblo’s “geographic hub,” Owens said. Planning began about a year ago. Meeting every other month, the all-volunteer festival committee has made do with a budget of less than $8,000, Owens said. Crucial support has come from about a dozen sponsors, including the Spanish newspaper Al Dia; the Mexican Post and Los Taquitos de Puebla restaurants; Transmex, a shipping company on Washington, and the Greater Philadelphia Tourism & Marketing Corp.
For example, she said, a screening of El Sol Sale Para Todos (“The Sun Rises for Everyone”), which chronicles the growth of the Mexican community in South Philadelphia, will be followed by a group discussion. Because illegal immigrants cannot get driver’s licenses, many move about by bike. So the Bicycle Coalition of Philadelphia will hold a bilingual bike-safety workshop. Gary Steuer, chief cultural officer in the city’s Office of Arts, Culture, and the Creative Economy, lives in the Bella Vista section of South Philadelphia. The Latino population there, driven largely by Mexican migration, jumped 170 percent in the first decade of this century. “The arts and media — sometimes for the worse, sometimes for the better — shape our perceptions of people, individually and as a group,” said Steuer, whose office is not formally involved in the festival. Contact Michael Matza at 215-854-2541 or mmatza@phillynews.com. For a complete listing of events, go to www.depuebloapueblo.org.